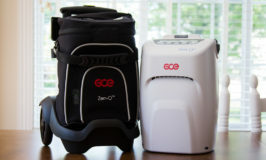 A new oxygen concentrator is now available that will be a benefit to oxygen users who are seeking a small, travel-sized, concentrator for night use, including use with a CPAP or BiPap machine. Respironics has just introduced the SimplyFlo. 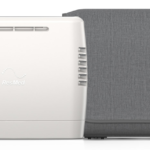 Combining the names of Respironics’ popular portable concentrator, the SimplyGo, and their home concentrator, the EverFlo, the SimplyFlo is a home concentrator that is small enough to pack for traveling, yet powerful enough to provide continuous flow oxygen. The new SimplyFlo is the same size and shape as the SimplyGo, without the bells and whistles, such as a battery, that make the SimplyGo portable. The SimplyFlo weighs only 8 1/2 pounds and provides up to 2 LPM continuous flow oxygen. This means the SimplyFlo is the smallest continuous flow concentrator that is approved by the FDA. It is fully compatible with CPAP and BiPap machines, or can be used alone to provide oxygen while sleeping. Until now, nocturnal-only oxygen users were forced to pack the larger EverFlo home concentrator, which prevented air travel, or purchase a portable concentrator, which was unnecessarily expensive for their oxygen concentrator needs. The new SimplyFlo overcomes both hindrances by providing the power of a continuous flow concentrator, with the size and weight of a portable concentrator, at a price that is affordable. The SimplyFlo is a welcome addition from the Respironics’ line of oxygen concentrators. Look for the SimplyFlo at OxiMedical or POC Medical. 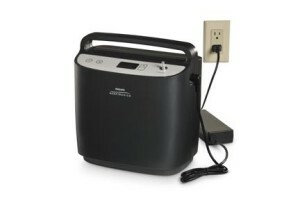 does anyone make a small oxygen concentrator that flows more than 3lpm that can be used with a bipap machine? No, unfortunately, the motor size and other components necessary to produce more the 3 LPM makes it difficult to provide a small unit. Currently, no manufacturer provides a POC that produces more than 3 LPM; however, O2 Concepts is working on an Oxlife POC that will produce 4 LPM. Rumor has it that it will not be available until next year.